Ideal for one operator to easily assemble boxes. Problem: Customer used two operators to build 40 pound boxes by hand. The operators were taking the flat boxes from a pallet and assembling them. Then had to lift and rotate the assembled boxes to add in their end product. The boxes are 5 feet tall unassembled by 4 feet long making them awkward and bulky to handle with a single operator. The operators were lifting the boxes anywhere from 10-12 times per hour making it a tough job. Also the second operator was not always available. Requirement: Pick up flat unassembled box, pitch 90 degrees to vertical, open box, operator fold down and attach flaps, then rotate 180 degrees to set down onto a pallet. Solution: A custom box vacuum lift, pitch, and rotate device powered by plant air. The air ran venturi pumps for vacuum and pneumatic cylinders for pitching and rotation. The tooling was integrated with a Gorbel Easy Arm. 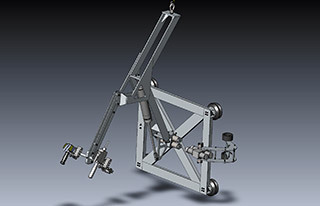 The Easy Arm is a Zero-Gravity PLC controlled hoist. Because the boxes were tall and varied in pick height from the floor to 50 inches, a floating handle was provided to keep the operators hands at a safe ergonomic level. A G-Force pendant handle was used instead of a Gorbel G-Force slide handle to give the operators leverage to move the tool when it was loaded and unloaded. The box lift assist was incorporated with our standard gripper safely circuit, which prevents the part from being released in mid-air. The Gorbel G-Force lift assist device allows for smooth, quick, and precise lifting of boxes to assist the operators in handling the large loads. Result: This custom lifting device integrated with a Gorbel Easy Arm was the perfect solution. With this cardboard box builder, one person can do the job without putting themselves in jeopardy of an injury or having to waste time looking for a second teammate to assist with the assembly. Ergonomic Partners solution provided increased production as well as injury prevention. 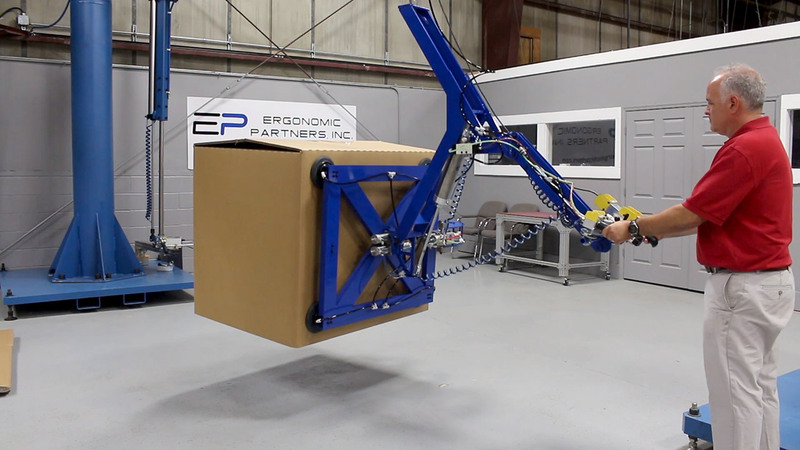 Ergonomic Partners has a LIVE DEMO of vacuum tooling and a Gorbel Easy Arm zero gravity articulated arm in our shop. Contact us today. Ergonomic Partners provides lift assist devices and other products; serving clients from coast to coast, Canada, Mexico and especially focused in the states of Missouri, Illinois, Indiana, Kansas, Arkansas, Mississippi, Nebraska, Tennessee, Kentucky, Iowa, and Oklahoma.